AMARAND, an Abbot of the Abbey of St. Peter of Moissac in south-western Gaul, who was Bishop of Albi at the end of the seventh century. St. Amarand reposed circa 700. CONGAR, (Sixth Century), said to have been a son of Geraint, Prince of Devon. St. Congar founded monasteries at Badgeworth and Congresbury (where he is buried) in Somerset, as well as at Llangennith (Welsh: Llangenydd/Llangynydd) in Gower, south Wales. It is generally believed that he flourished in the sixth century, though the English Menology states it was during the reign of King Ina of Wessex (r. 688–726). The calendar of the Moscow Patriarchate lists St. Congar, Bishop of Somerset on 27th November, albeit without a year of repose. making this a second Age of Saints, that thereby many souls may be saved. FLORENTIUS of STRASBOURG, an Irishman who emigrated to the Continent and settled in the forest near present-day Niederhaslach, France. Once settled, St. Florentius, built a monastery. He was consecrated Bishop of Strasbourg circa 678 serving that See until his repose circa 693. GÉBÉTRUDE (GERTRUDE), a granddaughter of St. Romaricus (8th December) and sister of St. Adelphus (11th September), St. Gébétrude was educated at Remiremont Abbey near the Vosges Mountains in Lorrain. At the completion of her studies, she received monastic tonsure at the Abbey, and later served as its third abbess. St. Gébétrude reposed circa 675. HERCULANUS, a Bishop of Perugia in Umbria. 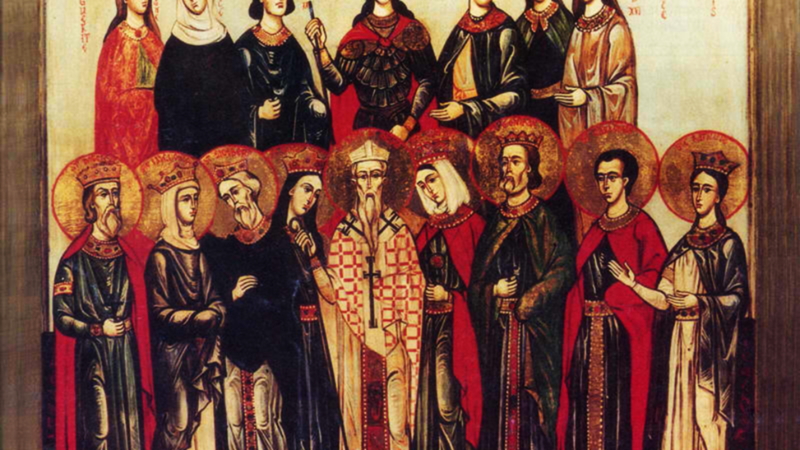 St. Herculanus was beheaded in 549 by Ostro-Goth soldiers by the order of their leader, Totila. PROSDOCIMUS, the first Bishop of Padua, who, according to tradition was sent there by St. Peter (29th June ). St. Prosdocimus reposed circa 100. RAVERRANUS, a late seventh century Bishop of Séez in Normandy. St. Raverranus reposed 682. No further information on his life is extant. RUFUS of METZ, an early Bishop of Metz. No information on St. Rufus is extant, though St. Bede the Venerable (25th May) notes a translation of St. Rufus' relics. He is thought to have reposed circa 400. TREMORUS (TRÉMEUR), (Sixth Century), the infant son of St. Triphina (5th July) and educated by Saint Gildas the Wise (29th January). St. Tremorus' pagan father, Count Conmore, whose hatred for Christianity seemingly had no bounds, beheaded his son solely for being Christian. WILLIBRORD (CLEMENT) of ECHTERNACH, APOSTLE of the FRISIANS, a Northumbrian missionary to the Low Countries. Working with eleven other monks many Frisians were brought to Christ. St. Willibrord was consecrated the first Bishop of Utrecht circa 696, taking the name of Clement. St. Willibrord reposed circa 739.